The delta(δ)-opioid receptors belong to the G protein-coupled receptors and in vitro studies have shown that δ-opioid receptors undergo an internalization process in response to agonist stimulation. The immediate consequence is the disappearance of receptors from the plasma membrane. This adaptation process reveals the cell's capacity to desensitize after a strong agonist stimulus. This process, if it occurs in vivo, could contribute to the tolerance phenomenon observed after opiate treatment. To study the mechanisms underlying regulation of the δ-opioid receptors in vivo, the effects of an application of the drug dermenkephalin, a potent and selective agonist of the δ-opioid receptor, were analysed in the rat spinal cord. Using immunocytochemistry and electron microscopy, we observed in control rats that membrane labelling was strictly localized at the interface between two neurites. Fifteen minutes after dermenkephalin stimulation, the plasma membrane labelling was associated with invaginated areas. Thirty minutes after stimulation, labelled vesicles were found in the cytoplasm confirming the internalization process. The present findings support the view that δ-opioid receptors are internalized in response to prolonged exposure to dermenkephalin in vivo and confirm the presynaptic localization of δ-opioid receptors in the dorsal horn of the rat spinal cord. The G protein-coupled receptors constitute a large family of receptors widely distributed in the mammalian central nervous system (CNS). Classical neurotransmitter receptors such as muscarinic acetylcholine receptors (mAChR), adrenergic, dopaminergic, serotoninergic as well as neuropeptide receptors belong to this family (1). In vitro studies in transfected cells show that following receptor activation by an agonist that induces signal transduction, G protein-coupled receptor undergoes phosphorylation, endocytosis, and dissociation from their ligand in the endosome, and finally the receptors are recycled to the plasma membrane (2, 3,4). The delta(δ)-opioid receptor is a member of the seven transmembrane superfamily of G-protein coupled receptors (5, 6). In vitro studies, carried out on NG108-15 neurohybrid cells which express large numbers of δ-opioid receptors, show that these receptors undergo a rapid agonist-induced desensitization that occurs within minutes and down-regulation that occurs more slowly over several hours (4, 7). The internalization of receptor-agonist ligand complex has been detected with similar kinetics to those of down-regulation (8, 9). These findings raise two related questions: 1) can δ-opioid receptors be internalized in vivo by the same agonist-induced endocytosis observed in vitro? and if this is the case, 2) does the internalization process have the same kinetics reported from in vitro studies? We examined the effect of dermenkephalin, a specific δ-opioid agonist, in order to mimic the effect of a strong and constant activation by an agonist, on the distribution of the δ-opioid receptors, in the dorsal horn of the rat spinal cord. We used a monoclonal anti-idiotypic antibody (anti-Id mAb) raised against the δ-opioid receptors (10), and detected by electron microscopic immunocytochemistry. In the present work, we demonstrate that δ-opioid receptor undergo rapid agonist-induced endocytosis in the CNS. Light microscopy revealed that the regional distribution of anti-Id mAb immunoreactivity in control rats receiving saline solution, was comparable to previous studies using unoperated rats (10, 11, 12, 13). A high concentration of immunoreactivity was localized in the superficial layers of the dorsal horn (Fig. 1a). In addition, labelling was found around the central canal (layer X) (Fig. 1b), and in the ventral horn. Ultrastructural study of lamina I and II showed that immunoreactivity was mainly localized at appositions between two neurites; axo-dendritic (Fig. 2a) and axo-axonic appositions (Fig. 2b) were noted. Some neurites displayed multiple labelling sites at appositions with dendrite and/or axon as shown in Fig. 3. We never observed staining directly at the level of a synaptic differentiation. However, synaptic differentiations were occasionally near or in continuity with sites of axo-dendritic labelling (Fig. 2a). Occasionally the labelling was at the interface between a neurite and a glial process in laminae I and II of the spinal cord. In all cases, it was not possible to associate the membrane labelling with one or the other profile due to the localization of the labelling strictly in the extracellular space. 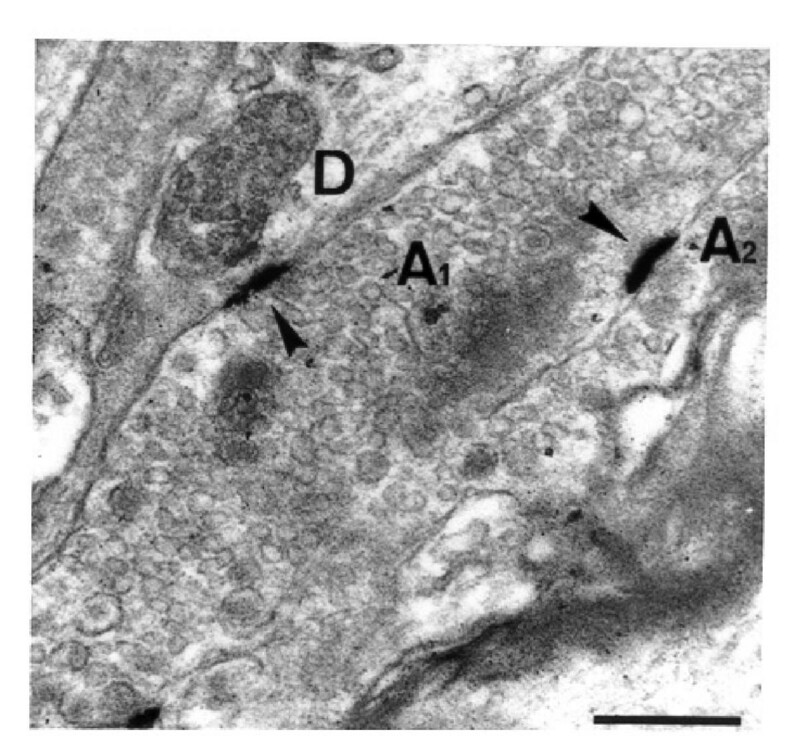 A few intracellular labellings were also found, mainly associated with rough endoplasmic reticulum (RER) and Golgi apparatus in the soma of labelled cells (not shown; see 12). 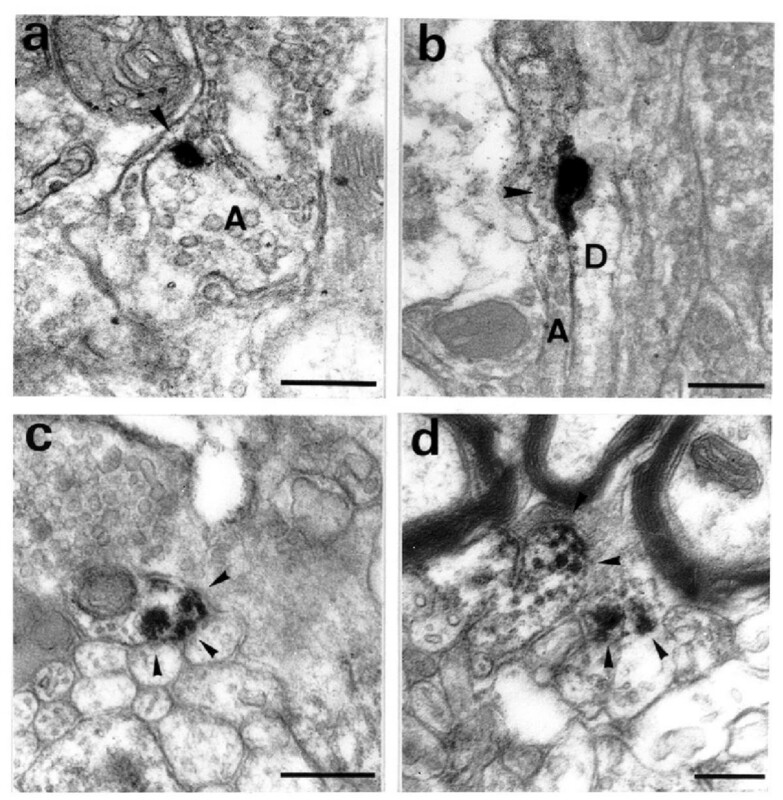 Light microscopy pictures of the anti-Id mAb immunoreactivity: In (a) at the level of the dorsal horn in cervical segment of the spinal cord, the labelling is particularly intense in laminae I and II as well as at the level of the dorsolateral funiculus. In (b) at the level of the central canal at the same cervical level, the immunoreactivity is mostly localized at the level of the lamina X. Scale bar = 200 μm. Electron microscopic localization of the anti-Id mAb labelled sites in lamina I of the rat spinal dorsal horn after an intrathecal injection of NaCl (Control rat). 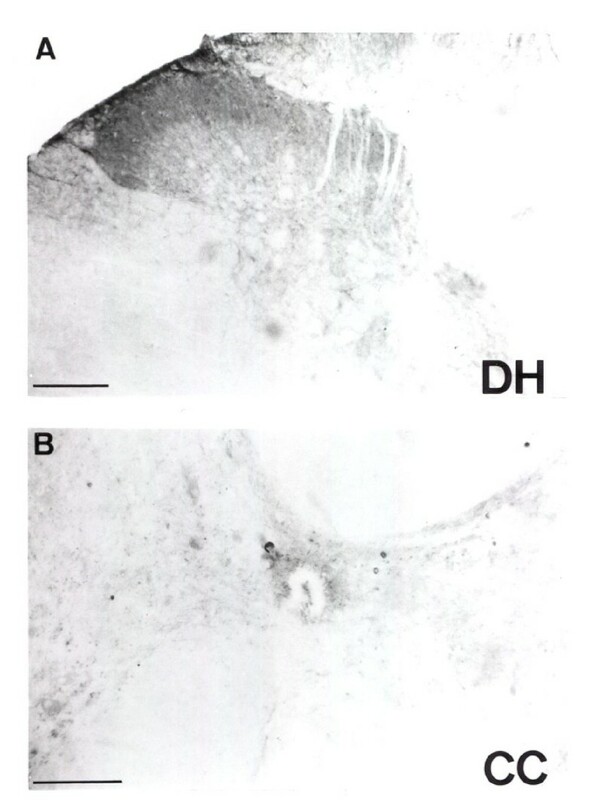 In (a) immunoreaction (arrowhead) was found at the interface between a glomerular C terminal (C), probably from a primary afferent, and a dendrite (D). Note the presence of synaptic differentiations (arrows) at proximity of the labelling but not at the level of the immunoreactivity. The labelling is strictly localized at the interface between the two neurites and cannot be associated with one or the other neurite. In (b), immunoreaction localized between two axons (A1 and A2). Scale bars = 500 nm. Immunoreactions found in lamina I of the spinal dorsal horn in control rats showing multiple labellings at the level of the same neurite. Two immunoreactive zones (arrowheads) are present between an axon (A1) and a dendrite (D), and at the interface between two axons (A1 and A2). In both cases, no synaptic differentiation was noted. Labelling is strictly localized to the extracellular space between the two neurites. Scale bars = 500 nm. For rats receiving the cocktail of peptidase inhibitors, at the ultrastructural level we observed a pattern of labelling comparable to that described in rats receiving a saline solution (not shown). No visible redistribution of anti-id mAb immunoreactivity was observed in response to kelatorphan and thiorphan. Fifteen minutes after dermenkephalin administration, the ultrastructural analysis showed a pattern of labelling quite different from that observed in the control rats in lamina I. At the level of labelling, the plasma membrane was noticeably invaginated (Fig. 4a and b). Most of the labelling was associated with axon terminals (Fig. 4a). Dendritic labelling was also found (Fig. 4b) but was less abundant. The rest of the labelling was associated with unidentifiable profiles. In lamina II, labelling was associated with both invaginated and flat plasma membrane. Immunoreactivity observed in the lamina I of the rat dorsal horn after dermenkephalin stimulation. In (a) and (b) after 15 minutes under dermenkephalin stimulation, labelled axons (A) or dendrites (D) were observed. Dense immunoreactive zones (arrowheads) were associated with invagination of the plasma membrane. In (c) and (d), after 30 minutes stimulation, immunoreactivity was found in the cytoplasm of the neurites. Labelling was associated with large vesicles close to the plasma membrane (c). Labelled microtubules were also found (d). Scale bars = 500 nm. In sections from the four animals studied after 30 minutes of stimulation, immunoreactivity was observed intracellularly. In lamina I, large vesicles (120 nm-150 nm) were labelled in the cytoplasm close to the plasma membrane (Fig. 4c). Labelled microtubules were also found (Fig. 4d). No extracellular labelling associated with the plasma membrane was found in this lamina. In lamina II, cytoplasmic labellings (mainly labelled vesicles) as well as membrane labellings not restricted to the invaginated area, were found. In this study, we provide morphological evidence that δ-opioid receptors are endocytosed in response to dermenkephalin in vivo. The choice of dermenkephalin as agonist in this study was determined by the intrinsic quality of this ligand. Isolated from the skin of the frog Phyllomedusa sauvagei (14), this natural peptide shows the highest affinity for the δ-opioid receptor (0.47 nM) and a selectivity of 4,000-fold greater for the δ- than the μ-opioid receptors, even when compared to the other very potent deltorphin I (isolated from the frog Phyllomedusa bicolor, 15) which has an affinity of 0.60 nM and a selectivity of 3,570 fold greater δ/μ. Both peptides, along with the dermorphin and the deltorphin II also isolated from amphibian skin, possess an unique feature among peptides synthesized by animal cells in having a D-amino acid residue, providing a very strong resistance to enzymatic degradation to these ligands. Considering our experimental conditions, particularly using a single in vivo injection, the dermenkephalin seemed the most suitable agonist ligand to specifically stimulate the δ-opioid receptor and provoke a possible internalization of the receptor due to its affinity as well as to its strong resistance to degradation. The selectivity of the rat monoclonal anti-idiotypic antibody used as primary antibody to recognize the δ-opioid receptor (anti-Id mAb) in the present report has been thoroughly investigated in previous studies (10, 12, 13). First, the anti-Id mAb raised against an anti DADLE (10, 11) totally inhibited the δ-agonist ligand/anti-ligand interaction, showing a good anti-idiotypic activity. Second, it was able to label the δ-opioid receptor expressed by the NG 108-15 cell line and inhibited 3H-DADLE binding to this same cell line. The anti-Id mAb was also able to precipitate a 52,500 Da molecule in the NG 108-15 cells. Third, in rat spinal cord (12), we found that preincubation of fixed tissue with specific δ-opioid ligands (DADLE, Met-enkephalin, dermenkephalin and naltrindole at 10-9 M) totally prevented the antibody labeling, showing a good competition between ligands and the anti-Id mAb. Fourth, we also found previously in rat spinal cord that anti-Id mAb has an hundred-fold greater affinity for δ-opioid receptors than μ-opioid receptors (12). Taken together, these data show that anti-Id mAb is a reliable tool to specifically detect the δ-opioid receptor using immunocytochemical techniques. In the present study, we found in our control group the same pattern of labelling seen by earlier studies in unoperated rats (10,11,12) suggesting that saline injection, at the level of the spinal cord, does not provoke a visible redistribution of the δ-opioid sites at the plasma membrane. No labelling associated with an invaginated plasma membrane was found in our experimental control rats. In rats receiving the cocktail of peptidase inhibitor (i.e. without dermenkephalin), no modification of the δ-opioid receptor distribution was noted compared with our control rats (receiving only NaCl). A previous study showed that kelatorphan in addition to blocking the degradation of the exogenous peptide by suppressing the aminopeptidase activity, markedly increased the spontaneous release of endogenous Met-enkephalin in vivo and in vitro (16). Thiorphan is a potent enkephalinase inhibitor (17). Nevertheless, it seems that under our experimental conditions, even if more enkephalin was released by the kelatorphan, and this enkephalin was selectively protected from degradation by thiorphan, no receptor endocytosis was observed in response to endogenous enkephalin. However, no nociceptive stimulation was applied in our protocol, and we therefore can not exclude the possibility that insufficient enkephalin was released to provoke the internalization of the δ-opioid receptor. Another hypothesis poses the question of whether the internalization process is agonist-selective. In a study carried out in vivo on guinea pig ileum (18), the authors showed a rapid endocytosis of the μ-opioid receptor in neurons in response to etorphine stimulation but not after morphine administration. This shows that using a high-affinity agonist such as morphine, it is not possible to trigger the endocytosis process. The authors suggest that morphine has low intrinsic activity at μ-opioid receptor compared for instance to the lower affinity μ agonist [D-Ala2,N-MePhe4,Gly5-ol]enkephaline (DAMGO) which is able to trigger an internalization process. This differential agonist-selective response for the same receptor could participate in mechanisms regulating cellular adaptation to ligands. We do not know if endogenous enkephalins are able to induce the endocytosis of δ-opioid receptors in vivo. A recent study carried out on organotypic cultures and neuromuscular preparations, demonstrated a possible internalization process of μ-opioid receptor by endogenously released enkephalins after electrical stimulation (19). Our data presented here show clearly that without any kind of stimulation the endogenously released enkephalins (even protected by enkephalinase inhibitors) were not able to induced an internalization of the δ-opioid receptors in the rat spinal cord. Nevertheless, a more specific study should be conducted in order to answer this question. By contrast, application of dermenkephalin induced an internalization of the δ-opioid receptor within 30 minutes. Dermenkephalin is markedly increased in potency in the presence of peptidase inhibition -more than one hundred fold with a cocktail of bacitracin, bestatin, and captopril- as in Kramer's study (20), and to a greater extent with kelatorphan and thiorphan as used in the present study. This suggests that the effect observed after dermenkephalin application, associated with the peptidase inhibition, is probably stronger than the potency of dermenkephalin alone. It seems that the δ-opioid receptor was internalized to a greater extent in the lamina I than in the deeper layers. This could be due to a gradient of diffusion in the tissues of dermenkephalin. Our results show a majority of labelling associated with axons, confirming the reports that δ-opioid receptors mainly have a presynaptic localization in the dorsal horn of the rat spinal cord (12, 21, 22, 23). On the other hand, association of labelling with a dendrite is consistent with the existence of a postsynaptic δ-receptor population in lamina I and II. This is in agreement with data obtained after unilateral dorsal rhizotomy which showed residual and presumably postsynaptic δ sites (21). We cannot exclude the possibility that labelled vesicles found in the cytoplasm after 30 minutes of stimulation, may correspond to receptors in the process of expression to the plasma membrane. Studies using direct antibodies raised against the δ-opioid sites has shown immunoreactivity mostly associated with large dense core vesicles in the normal rat dorsal horn (22, 23). Intracellular labelling was also found in our control rats but the association of labelling was mainly with RER and Golgi apparatus in soma, probably corresponding to receptors in the process of synthesis or recycling. This observation confirms findings described in our recent study where somatic labelling was detected (13). Also, a few labelled vesicles have been outlined in our previous study (12), but the frequency of this association was slight and not comparable with those described in the present study after stimulation by dermenkephalin. The differences found in the distribution of the labelling (membrane labelling versus intracellular labelling) between our study and the direct antibody study (23) may be due to the intrinsic characteristic between an anti-idiotypic antibody raised against the binding site of the receptor and a direct antibody recognizing a fragment of the receptor. Taken together, the data suggest that immunoreactive vesicles found in our study are the result of an internalization of the δ-opioid receptors in response to the stimulation by dermenkephalin. Our results indicate that δ-opioid receptors undergo rapid agonist-regulated endocytosis which is similar to that exhibited by a variety of peptide hormones and growth factors (24, 25) as well as certain G protein-coupled receptors, like β-adrenergic receptors (4), neurotensin receptors (26), or substance P receptors (27). In adrenergic receptors, which have been characterized in detail, rapid endocytosis appears to be required for resensitization of receptors following agonist-induced phosphorylation (28). For opioid receptors, the fate of the internalized receptors is still uncertain. In vivo studies have shown that [3H] lofentanyl, a mu agonist, is internalized in axon terminals of rat vagus nerve and transported retrogradely in the nodose ganglion (29). A more recent study carried out in rat spinal cord slices found a possible internalization of μ-opioid receptor after stimulation by DAMGO (30). In vitro studies carried out on NG108-15, a neurohybrid cell expressing δ-opioid receptors, showed internalization after the application of opioid agonists in bath medium, like DADLE or etorphin (9, 31). The internalized receptors are then compartmentalized in particular into lysosomes and Golgi apparatus (32). More recently, in vitro studies carried out on δ-opioid receptors, showed that following a rapid internalization in response to an agonist stimulation, the endocytosed receptors were recycled back to the plasma membrane (33). It seems that the internalization/recycling process is a necessary step in the resensitization of the receptor. In vivo, due to the current experimental conditions, the fate of internalized receptors remains to be examined. Our findings demonstrate that dermenkephalin, after in vivo administration, can induce an internalization of the δ-opioid receptor at the level of the spinal cord. The effect of the reduction of receptor number at the plasma membrane might be a rapid decrease of the physiological response to the stimulus. These results bring an important confirmation that data obtained in an in vitro system for G protein-coupled receptor internalization (3) are relevant to the CNS in vivo. The consequences on receptor expression (recycling and/or degradation) remain to be established. Experiments were performed on twelve male 200-300 gm Wistar rats, housed in controlled environmental conditions (22 ± 1°C, 12 h alternate light-dark cycles, food and water ad libitum) for at least one week before being used for the experiments. Three groups of four animals were used: two groups received dermenkephalin and one control group received 0.9% NaCl. Two additional rats received a cocktail of peptidase inhibitors (i.e. without dermenkephalin) in NaCl for 15 and 30 minutes to check if the endogenous enkephalins protected by kelatorphan and thiorphan could, by themselves, induce receptor internalization. Under deep urethane anesthesia (1.5 g kg-1 body weight), the cisterna magna was opened. A catheter was inserted intrathecally in the subarachnoid space to the level of the fourth or fifth cervical segment. The two experimental groups received intrathecally 10 μl of a mixture containing 10 μM of thiorphan and 20 μM of kelatorphan (to delay the degradation of the peptide ligand) and 10 μM of dermenkephalin (Tyr-D-Met-Phe-His-Leu-Met-Asp-NH2, Sigma, a selective δ agonist (14, 34)), in 0.9% NaCl. Control rats received 10 μl 0.9% NaCl. A few minutes after injection, the catheter was gently removed. Fifteen or 30 minutes after the intrathecal injection, the rats were perfused with 100 ml of 0.9% NaCl containing 0.1% sodium nitrite as washing solution followed by about 800 ml of fixative containing 4 % paraformaldehyde in Sörensen buffer (0.1 M, pH 7.4). The procedure for the ultrastructural localization of δ-opioid receptors was carried out as previously described (12). Briefly, transverse sections of cervical and thoracic cord (50 μm) were cut with a vibratome. A rat monoclonal anti-idiotypic antibody (anti-Id mAb; 8 mg/ml;), generated against an anti- D-Ala2-D-Leu5-Enkephalin (DADLE) antibody and displaying affinity for δ-opioid receptors (10, 12), was used as the primary antibody. The sections were incubated with the anti-Id mAb at 1:500 dilution in Sörensen buffer containing 3% normal sheep serum overnight at 4°C, followed by an incubation with biotinylated anti-rat IgG (1:200 dilution for 1 hour, Vector Laboratories) and then with avidin-biotin-horseradish peroxidase complex (ABC-HRP, Vector Laboratories) for 1 hour. After rinsing, the peroxidase activity was revealed with 3,3'-diaminobenzidine (Sigma, 15 mg/50 ml Tris-HCl in the presence of 0.01% hydrogen peroxide). Finally, the sections were postfixed with 2% osmium tetroxide, dehydrated and flat embedded in araldite. Semithin and ultrathin sections were cut and contrasted with lead citrate and examined with a JEOL X100 electron microscope. We thank Pr. André Calas for critical reading of this manuscript and Pr. Allan I. Basbaum of the Keck Foundation Center for Integrative Neuroscience, University of California, USA, for helpful discussions. The anti-idiotypic antibody is a generous gift of Dr. Anny Cupo of the Institut de Pharmacologie, Moléculaire et Cellulaire, CNRS UPR 411, Sophia Antipolis, France. This work was supported by grants from the Ministère de la Recherche et de l'Espace (MRE), France and the Association pour la Recherche sur le Cancer (ARC).